While we continue to ponder whether or not the Big Trouble in Little China remake starring Dwayne Johnson is a good thing, we now have something new and exciting to pour over from the original movie itself. As we approach the 30th Anniversary of Big Trouble in Little China, which was released July 2, 1986, we have a first look at the big coffee table book that explores the making of the movie. Along with the cover art, we also have two behind-the-scenes photos. Thanks to Entertainment Weekly, we get a sneak peek at this awesome tome from authors Tara Bennett and Paul Terry. At the time of Big Trouble's debut in theaters, the Fourth of July release date window wasn't what it has become today. And the movie didn't fare too well amongst other big summer blockbusters. Its box office reception was tepid, to say the least, pulling in just $11 million. Even though the movie is now a big cult hit, it also didn't fare well amongst critics during its initial run. The movie follows the iconic Jack Burton, played by Kurt Russell, a dimwitted truck driver who teams up with his much smarter friend Wang (Dennis Dun) to save the man's green-eyed finance from a monster-filled underworld hiding beneath the San Francisco sewer system. BOOM! Studios will release the book The Official Making of Big Trouble in Little China this August. And it promises to deliver hundreds of never-before-seen behind-the-scenes photos along with interviews from both the cast and crew. Authors Tara Bennett and Paul Terry are self-proclaimed super fans who have seen the movie literally thousands of times, first discovering it on VHS back in the 80s. They pitched the idea to 20th Century Fox, which guaranteed the word 'official' would be part of the book's title. In writing the book, they had to track down all of the actors and crew members they could find. Director John Carpenter was the very first person to agree to a sit down chat about the movie. But securing some of the others wasn't so easy. About culling together all of the fun stuff that is revealed for the first time in the book, Paul Terry says this. "One of the exciting things was that we were able to go to the Fox archives, which are like the end of Raiders of the Lost Ark crossed with the X-Files archival rooms. We did a deep dive into things that had never seen the light of day. Beyond the key art, which is approved and given out to press, people hadn't seen any of these photos of the film being made, the actors goofing around on set, production, development. Once we starred diving into literally thousands of photos, we realized that there was going to be a ton of stuff to organize and choose from. We don't skim through anything. We make sure we really deep dive. We've gone pretty crazy with the deep-diving. But it's been so fun because we love the movie." Thanks to EW, we have a look at the book's cover, which reuses the original one-sheet poster art. 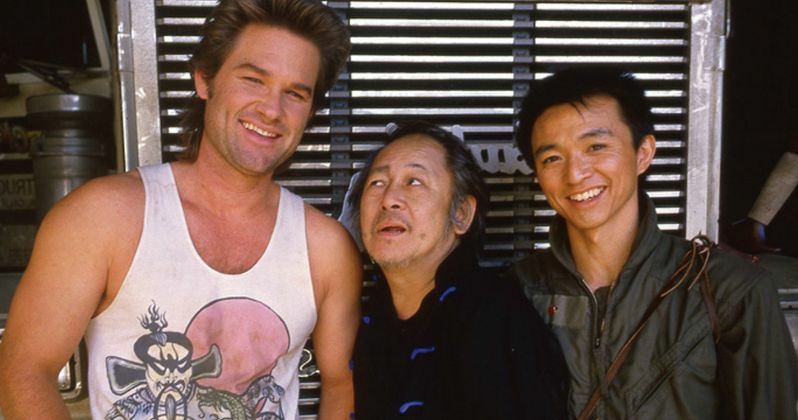 There is also a behind-the-scenes photo featuring Kurt Russell, Dennis Dun and Victor Wong, and another with James Hong putting on his David Lo Pan make-up. At this time, Dwayne Johnson is preparing to pull on the iconic leather boots of Jack Burton and head back into the San Francisco sewer system to fight ancient Chinese gangs and creepy monsters in the Big Trouble in Little China remake. But at this time, the remake doesn't have a set start date. And a director has not been chosen just yet. In the mean time, take a look at the original, a classic that many don't believe can be touched.